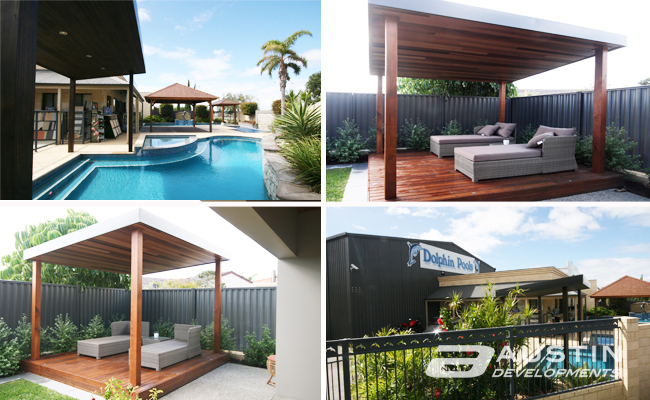 To showcase some of our unique and stylish timber cabana and gazebo designs, we have installed a number of our most popular designs at the Dolphin Pool display centre which you can experience the beauty and functionality that one of these timber structures can bring to your backyard. You can even see our latest skillion roof designs. Our display will give you an idea of what can be achieved through the use of different styles an materials including; a hardwood ironwood shingle roof with bamboo lining, cedar shingle roof, and skillion Colorbond roof with Glosswood Possum lining boards. Our display are different styles an materials including; a hardwood ironwood shingle roof with bamboo lining, cedar shingle roof, and skillion Colorbond roof with Glosswood Possum lining boards.